This book is in stores now and is a finalist in the New Zealand Post Book Awards. As remarkable as this sounds, when I first travelled to Australia, at the age of 20, I was taken aback to find that there were a number of James Cook monuments, hotels and the like. And that Joseph Banks was responsible for naming all of their plants too! The problem is that you only know what you know, and what you are taught and exposed to. In my case, post-colonial views of history that seem to only focus on the New Zealand aspects of the voyages, and have removed, or at the very least diminished, certain key history makers from the stories. 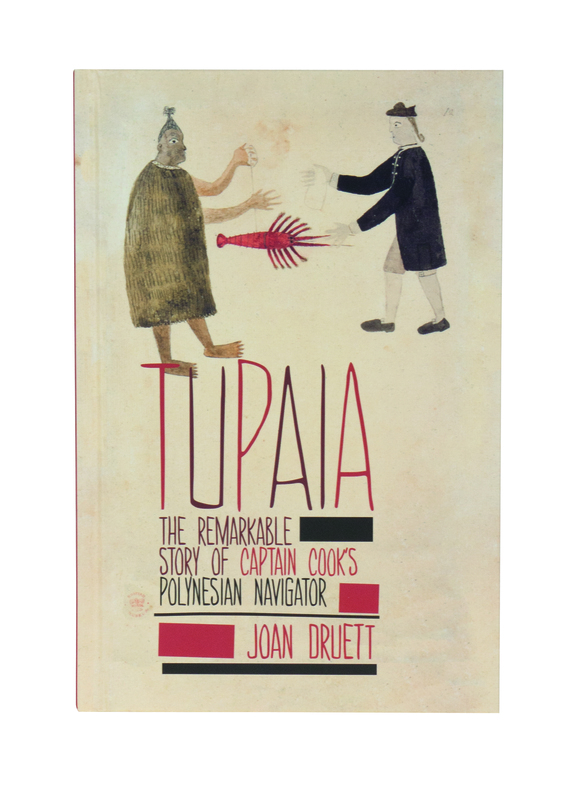 Tupaia, a noble Polynesian who encountered Captain James Cook in the Tahiti Islands and set sail with him on his journey south aboard the Endeavour, is one of them. Immediately Druett had my attention and she held it until the end. That the Crew of the Endeavour were not the first Europeans to meet Tupaia was probably “lost in translation”. But, in reality, by the time Cook and Banks arrived, Tupaia had already met and traded with another crew of Englishmen, and a French contingent led by Louis De Bouganville. Regardless of these prior meetings, the meeting of the Endeavour crew on April 11, 1769 was momentous since as Druett puts it “the expectations of all on board had reached a pitch of excitement.” They could never have anticipated that they would sail away with local men on board, who would prove to be crucial for Cook’s navigation of both the South Pacific seas and its people and customs. You know what happened next – the Endeavour crew sailed south to New Zealand. Tupaia, according to Druett’s meticulous research was a key figure on the boat, but he succumbed to illness before arriving back to England, and was almost forgotten in the public aftermath. Almost. This engaging book, has made me reflect on the facts of the Cook voyages; reminding me that there were dozens of people either on board, or that the crew encountered on these great voyages of discovery. Tupaia was just one of them – a translator, astronomer, navigator, artist, mapmaker, geographer – one of a number of remarkable men of the time. And this is his story. This entry was posted in Book review, Ockham New Zealand Book Awards Finalists and tagged 9781869793869, 9781869797133, captain james cook, endeavour crew, joan druett, joseph banks, Random House, tahiti islands, Tupaia by booksellersnz. Bookmark the permalink.